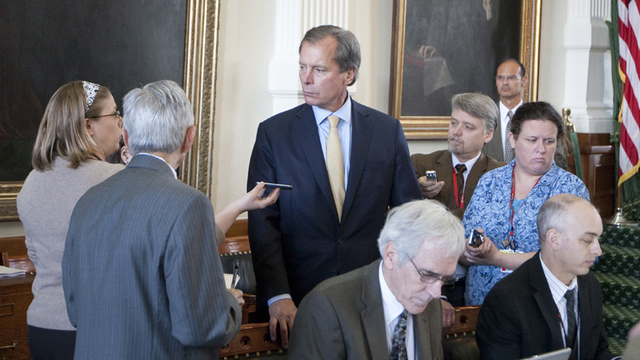 Texas lawmakers are going to have to figure out what a reporter is. You have no reason to care about this, unless you want to keep up with what is being done in your name at the Texas Capitol, and you think having reporters on the floor of the House and Senate increases your chances of finding out. On the flip side, there is the legitimate concern that a news reporter who might also be a lobbyist and campaign activist could be prowling the floor next session with a media pass dangling from a lanyard, talking to lawmakers as they consider bills. This month, the Texas Ethics Commission fined Michael Quinn Sullivan $10,000 for failing to register as a lobbyist in spite of evidence “that part of Sullivan’s regular employment involved making direct contact with members of the Texas Legislature and their staffs to influence the outcome of bills, nominations, and other matters that were subject to legislative action.” It disregarded what it called “baseless arguments” that he is a member of a news organization not required to register. The Sullivan case is not about news media credentials for access to lawmakers, but about the purpose of that access. Sullivan’s lawyer argued (Sullivan did not testify) that Empower Texans, the group he heads, is a media organization and suggested the state has to prove that it is not one. Sullivan will appeal the commission’s ruling and the fine that came with it, according to the lawyer, Joe Nixon. These are blurry lines, and not just in Texas. The rise of digital media — and, more to the point, the ability of anybody with a computer to go into the news business — has obliterated established definitions. It might seem a bit weird, given what gets written about legislators on a regular basis, that the Texas House and the Texas Senate allow credentialed reporters and photographers into their chambers while they are in session. News people have to remain outside the brass rails that encircle those two rooms, but like the attendants around the edges of a bullfighting arena, they are right down there where the action is. Questions pile up quickly. Should publications or blogs with an ideological point of view be allowed? Writers from newspaper editorial boards who regularly opine about legislation and urge lawmakers to vote in a particular way? Organizations that publish news but that have other divisions or operations that lobby? News organizations that are subsidized by taxpayers? Reporters are allowed special access not because legislators want reporters to be happy — it is because the lawmakers want access to the people who write about them. Lobbyists, however, are kept at bay. They stand outside, in the lobbies for which they are named, or sit in the galleries overlooking the arenas they are not allowed to enter. Increasingly, they watch the proceedings online or on cable TV and go to the Capitol only to meet legislators in their offices or to watch committee meetings. The same technologies that have made everyone a potential journalist have also made access to government easier. You no longer need to be in the fishbowl to watch the fish. Nothing prevents lawmakers from inviting anyone onto the floor other than rules and laws that those legislators could change. They have decided to keep some out, barring those who — whatever else they might be doing — are being paid to persuade lawmakers to vote in a particular way or to take a particular position. Credentials are more about privileges than First Amendment protections, but the definitions of who is and who is not in the news media are dated. Legislators will not have to follow the court decision in the Empower Texans case, whatever it turns out to be. They will have to do something, though, and they might find some guidance when the courts rule. Whether Sullivan gets in or not, some outlet that has never had news media credentials during a legislative session will ask for them, and the state will have to decide what makes a reporter a reporter.